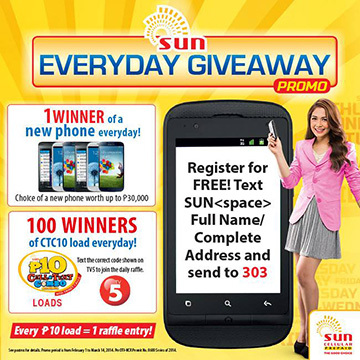 Join the Sun Cellular Everyday Giveaway Promo 2014 and get a chance to win a new phone EVERYDAY and be 1 of 100 winners of Sun CTC10 loads daily! Simply register SUN Everyday Giveaway Promo and get a e-raffle entry! Join Now! See mechanics below. Text SUN <space> FULL NAME/ COMPLETE ADDRESS to 303 for FREE! Get one (1) e-raffle entry for Php10 load. Text the correct code shown on TV5 to join the daily raffle. *Choice of a new phone worth up to Php 30,000. Promo runs until March 14, 2014 only. Per DTI-NCR Permit No. 0600 Series of 2014. Visit Sun Cellular Prepaid Facebook page for more details and latest updates. Saan po ba lalabas yung mga Code? nanalo na po ako pero ung price di pa dumaraing sabi last month after 3weeks tpz wala nakita ko na ung name ko sa commercial ng sun sa T.V 5 ung mga winners tapos until nw la bat ganun bat parang ang tagal…..